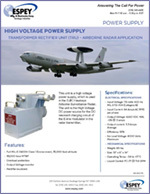 Espey developed this power supply for the AN/APN-169 station-keeping radar system for a prime military contractor program. 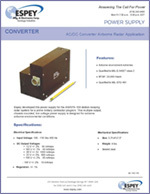 This multiple output, chassis mounted, low voltage power supply is designed for extreme airborne environmental conditions. 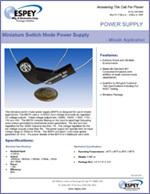 Espey developed this power supply for the AN/APN-169 station keeping radar system for a prime military contractor program. This multiple output, 10 kV, high voltage DC-DC converter module is designed for extreme airborne environmental conditions. 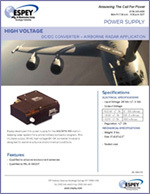 High Voltage Power Supply, featuring Full MIL‑E‑5400H Class 1 Environment to 35,000 foot altitude. This HVPS is used in the E-2C Hawkeye Airborne Surveillance Radar. 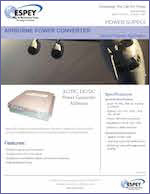 The unit is the High Voltage DC power source for the DC resonant charging circuit of the E-line modulator in the radar transmitter. 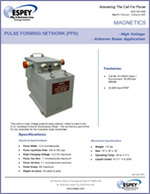 This unit is a high voltage pulse-forming network, which is used in the E-2C Hawkeye Airborne Surveillance Radar. The unit forms a part of the E-Line modulator for the Coaxitron radar transmitter. 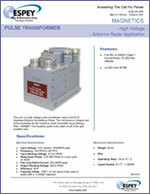 This unit is a high voltage pulse transformer used in the E-2C Hawkeye Airborne Surveillance Radar. The unit forms an integral part of the modulator for the Coaxitron radar transmitter by providing a 20kV, 200AMP, 13uS positive pulse to the plate circuit of the grid amplifier tube.